The world’s biggest superpower has a problem. The citizens of a nation overseas have risen up against their tyrannical rulers, determined to claim liberty even if it takes a civil war. As the most powerful global advocate of freedom, the superpower has to admire the rebels’ cause. Should it help them? Humanitarians argue that intervention can prevent hundreds of thousands of civilians from suffering hideous state-sponsored subjugation. Economic considerations also loom large: one of the superpower’s most valuable commodities comes from this region, and trade disruptions will have an immediate impact at home. It may sound like America’s dilemma over Libya in 2011, but like so much of the “news,” it actually describes history. 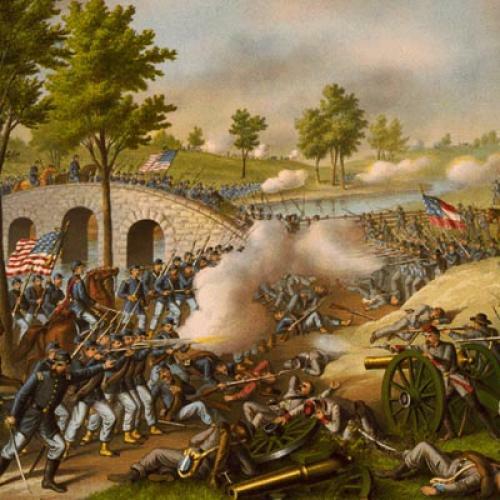 In 1861, the United States was the nation divided by civil war—and Britain, the pre-eminent military and industrial power, had to decide how to respond. Amanda Foreman’s teeming, bustling book delivers a panoramic history of “Britain’s crucial role in the American Civil War.” While a torrent of sesquicentennial volumes provide the twenty-thousandth-and-counting analyses of how war divided Americans, A World on Fire promises something fresh: a chronicle of how the conflict split Britons, too, from Westminster politicians debating which, if any, side to support, to legions of volunteers who decided with their feet by enlisting in Union and Confederate forces. Foreman attracted a mass audience with her best-selling biography Georgiana: Duchess of Devonshire, and she plays to that book’s strengths by opening A World on Fire with a high society ball. But the twirling skirts (propped up, Foreman pauses typically to note, by “W.S. Thompson’s new steel crinoline cages”) form only a decorative prologue to Foreman’s deadly story, a myth-shattering saga of political intrigue, moral confusion, and inescapable gore. So surely Britain would condemn “Slaveownia,” as Punch dubbed the Confederate States of America? Victorian Liberals, who headed the British government throughout the Civil War, abhorred slavery as ardently as one would expect of a party named for liberty. Yet every nation rides slipstreams through its history, and the surging narrative of abolitionism ascendant has let Britain glide too easily over the imperial past. (A few years ago New Labourites celebrated the 1807 bicentennial as a milestone in the great British journey from global empire to multicultural democracy, as if the good that Britons did in acknowledging the evil made up for wrongdoing in the first place.) Foreman will have none of this. With unsentimental authority, she details how abolitionism got overshadowed as other interests drew the British government to the verge of supporting the very slaveowners it deplored. FREEDOM is a rangy, broad-shouldered value, capable of heavy rhetorical lifting. Liberals had coalesced around another form of freedom: free trade, the bedrock of British industrialization. Abolitionism had taken root in the partly protectionist, largely rural soil of late eighteenth-century Britain. Now panting, shrieking trains ripped through a land studded by smokestacks and mines; conurbations crawled over hillsides like great black snakes. Touring the factory towns spawned by late industrialization, Friedrich Engels described the socially deadening grind of workers who toiled interminable shifts at the steam-powered looms, trudged home to fetid slums, supped on potato parings, and nursed their babies on gin. Which are composed of cotton. Textiles were Britain’s biggest business, and cotton from the deep South was its biggest source. The Union blockade of Southern ports snipped the supply line to millions of Britons reliant on the industry. The resulting “cotton famine” hit hard and fast: within a year, 400,000 British workers were unemployed or nearly so, putting their 1.5 million dependents at risk. State welfare cases quadrupled in months. Even the staunchest abolitionists, Prime Minister Palmerston included, had to see the crisis in Lancashire as a more pressing humanitarian problem for the government than the plight of far-off slaves. Recognizing the Confederacy, or at least evading the blockade, could restore the cotton supply, while joining the Union might deepen and prolong the suffering at home. Then there was the political freedom that Liberals championed abroad: the freedom of people to govern themselves. Palmerston—whose “attitudes,” Foreman nicely observes, “had been formed in the age when wigs and rouge were worn by men as well as women”—had made his reputation as a defender of national self-determination, in Belgium, Greece, Italy, and Hungary. (Never mind that he also sent in gunboats to assert British power in the Middle East and China.) Why not the Confederate States of America? “The South fight for independence; what do the North fight for except to gratify passion or pride?” asked the home secretary. The rising Liberal star William Ewart Gladstone fancied he saw shades of Garibaldi in Jefferson Davis. “We may have our own opinions about slavery,” Gladstone declared the day after the Emancipation Proclamation ran in the Times, “we may be for or against the South, but there is no doubt that Jefferson Davis and other leaders ... have made a nation.” (Gladstone, later revered as the “People’s William,” had delivered his maiden speech defending his plantation-owning father’s treatment of slaves.) Give the Confederacy political freedom, these men assumed, and freedom from slavery would follow. “FOR GOD'S SAKE let us if possible keep out of it,” was the sophisticated conclusion of Lord John Russell, the foreign secretary, when he weighed up the three freedoms—individual, economic, political—at war. In May 1861, Britain declared neutrality. From now on, American diplomats vied with Confederate agents to force Britain off the fence, while events added pressures of their own. The Union’s unauthorized boarding of the British ship Trent, in November 1861, pushed Britain to the brink of war. The Union in turn resented Britain for the depredations of the CSS Alabama, built in the Liverpool shipyards in violation of neutrality. But it was the appalling humanitarian crisis of unprecedented, unrelenting butchery on American battlefields that nearly tipped the balance. As many men could fall in a single day—25,000—as Britain had lost in the entire Crimean War. In late August 1862, the Confederate victory at Bull Run put Lee’s army a mere twenty miles from Washington after a ferocious slaughter. Three weeks later, on the deadliest day in American combat history, the Union turned the tide at Antietam, at a cost of 23,000 casualties. Britons reading the news may not have imagined the carnage as vividly as Foreman—bullets ripping out teeth and tongues; silver tubes thrust down men’s throats to save them from choking on their own blood; “the whole landscape,” as one soldier put it, “for an instant turned slightly red”—but they just knew the violence had to be stopped. “Was there ever any war so horrible?” asked Russell. Bull Run prompted him to develop a mediation plan designed to recognize the South and end the killing. As he did so, Lincoln seized the momentum of Antietam to issue the Emancipation Proclamation. Though Britons scoffed at its limitations (it freed only Confederate-owned slaves), the Proclamation put the slavery issue squarely on the table at a critical moment. On November 11, 1862, Russell’s plan came before a cabinet wrestling with multiple crises. Workers starved in Lancashire, where Confederate agents rallied support for intervention. Unimaginable bloodshed saturated American battlefields, convincing Palmerston to wait until an outcome was clear before risking British troops. Yet the lines had been drawn over slavery, and no political party could brook supporting the “peculiar institution.” The result? “Everybody present threw a stone at [Russell’s plan] of great or less size, except Gladstone, who supported it,” reported the British secretary of war. Faced with so many challenges, the cabinet chose the only uncontroversial course: to do nothing. Neutrality would endure. November 1862 proved to be the last best chance for British intervention on the side of the South. It is tempting to see it, like May 1940, as one of Britain’s historic decision points, in which a clear-eyed commitment to moral purpose defeated a sniveling short-term pragmatism. But Foreman’s careful presentation, day by day, month by month, shows how confusing history looks while it is happening—even to such conviction politicians as Palmerston, Gladstone, and Russell. Ideological commitments that march in step in one context, and in hindsight, can swerve troublingly apart in others. What makes this book important is not just that it tarnishes the Liberal gilt. (Union accusations of tacit British support for the South continued to fly, as did Confederate efforts to draw them in.) A triumphantly anti-reductionist antidote to the sound-bite history so prevalent today, Foreman’s book insists on the contradictions and the competing interests inherent in any such foreign engagements. A World on Fire ought to be required reading for anybody encouraging overseas intervention in the name of human rights. Dawson was one of thousands of Britons who broke British law to join up—and one of two hundred characters Foreman brings to the page in what she describes as a Dickensian “history-in-the-round.” “Ken Burnsian” would be more accurate, given how she interweaves the doings of generals and statesmen with the deeds of ordinary women and men. Where Dawson forced his way into the war, others accidentally stumbled into it, like Mary Sophia Hill, a forty-year-old British schoolmarm in New Orleans, who became a nurse to keep an eye on her hapless enlisted twin brother, Sam. Foreman delights in marvelous cameos and coincidences. The Welsh emigrant John Rowlands—or Henry Morton Stanley, as he now styled himself—was browbeaten by his Arkansas neighbors into joining the Dixie Grays. Shiloh taught him that “glory ... was a glittering lie,” and in a putrid, vermin-infested Union prison camp, he switched sides simply to escape the squalor. Stanley made it out of the war and on to celebrated adventures, “discovering” Dr. David Livingstone in Central Africa some years later. Did he ever learn that Livingstone’s son Robert was also fighting under an assumed name, also taken prisoner, and killed in North Carolina in 1864? Foreman’s vast cast of characters represents a huge narrative ambition, especially given her previous success as a biographer. A World on Fire seems in many ways to be the antithesis of Georgiana, swapping ballgowns for bandage rolls, and sidelining love affairs for political ones (though Georgiana also revealed Foreman’s taste for political history), and bypassing a forceful dramatic lead in favor of two hundred bit players. The diversity of British experiences on the ground reinforces the picture of complexity at the top, and Foreman brilliantly succeeds in capturing the aimlessness of history for the people who end up, however fumblingly, fashioning it. (I regret only her annoying habit of writing as if women make history by their first names and men by their last.) Union, Confederate, or (like Stanley) both, the only thing the British volunteers seemed to share was a resistance to being identified as English: in immigrant-friendly America, anybody who could possibly claim Welsh, Scottish, or Irish heritage made sure they did. Inevitably, Foreman’s approach comes at the expense of strong connective threads. The most obviously Dickensian feature of this book is its length, and despite the jaunty chapter headings, the through-lines are hard to follow. One episode of blockade-running or invasionplotting or diplomatic wrangling merges into the next; characters vividly introduced in one chapter need to be re-identified when they pop up hundreds of pages later, and few if any become threedimensional. The political momentum that drives the first third of the book devolves into circuitous negotiation and relentless combat, just as it did for the actors themselves. Foreman marches the reader from one hellhole to the next, following the British participants as guides. Chancellorsville, Gettysburg, Chickamauga, the Wilderness: the pages drip with ghastly testimonials to the horror of it all—but what do the British show that Americans have not already seen? Frank Vizetelly, a British war artist and correspondent for the Illustrated London News, gives the best answer. Big, boisterous, red-bearded, and manic depressive, Vizetelly embedded with American troops for the entire war, chronicling the action in stirring images designed to manipulate the viewer’s sympathy. Thirty of them are reproduced here, providing a magnificent visual commentary on the action. Vizetelly started out with the 2nd New York Regiment, but in Memphis he underwent a conversion: “A ‘peculiar institution’ of theirs had prejudiced me somewhat against them,” he admitted of the Southerners, yet now he felt the full force of their desire to be free. From then on Vizetelly followed the men in gray, drawing General Jeb Stuart galloping like a latter-day cavalier with the Confederate flag whipping in the wind, and refugee women and children haloed in innocence like angels in the forest, and footsore warriors doggedly marching through burning woods. If they could not be victorious, he could at least make them glorious. Most readers will know one ending from the start. At Ford’s Theater on April 14, 1865, just days after Lee surrendered at Appomattox, Laura Keene performed for the thousandth time in Our American Cousin, a British farce that poked fun at Americans’ strange manners. Lincoln decided to go for a laugh; it was, of course, his last. Frank Vizetelly chronicled a less familiar end, traveling with Jefferson Davis on the run. Despite the certainty of defeat, Vizetelly drew Davis signing orders by the road “as if it would only be a matter of time before the Confederacy was made whole again.” But as Davis’s government crumbled around him, he “determined to continue his flight almost alone.” Vizetelly sorrowfully parted with his tragic hero, pressing £50 into his hand, enough for the Davis family to take passage to England. In the coming months the American states united again, British volunteers made their way home or stayed on, and outstanding Anglo-American claims went to the courts. Henceforth it was for politicians and historians to debate whether “Britain’s crucial role in the Civil War” had simply made neutrality a cover for supporting the South. In the longer view, though, the Civil War undoubtedly proved more crucial for Britain and its empire. The Union blockade brought boom times to cotton cultivators in Egypt and to a lesser extent in India, who stuffed the maw of British demand. But when American cotton surged back onto the market, prices collapsed, touching off a global economic crisis. It starved out Indian peasants, who became a receptive audience, much later, for Gandhi’s textile boycott. Egypt’s Khedive Ismail went belly-up and sold his Suez Canal shares to the British government. As British investors enjoyed their economic freedom, British legislators broadened out political freedom. The Reform Act in 1867 significantly extended the franchise at home, while the Confederation of Canada in the same year delivered greater self-government to America’s imperial neighbor to the north. But freedom remained an uneasy mantra for the world’s largest empire. At Morant Bay, Jamaica, in 1865, the governor brutally suppressed a protest by dispossessed free blacks, killing hundreds. British radicals demanded the governor’s indictment for murder; but others (including Dickens), reeling from the spectacle of mass emancipation in America, praised his decisiveness. Fights over freedom continued to divide the British world. Thanks to the brutalizing effects of the Civil War, and the massive quantities of weapons it put into circulation, they got dramatically more violent. Maya Jasanoff is professor of history at Harvard and the author, most recently, of Liberty’s Exiles: American Loyalists in the Revolutionary World (Knopf). This article appeared in the October 6, 2011, issue of the magazine.